On 24th of October 2016, a team from the ICD had the pleasure of interviewing Mr. Luigi Mercuri, director treasurer of Società Dante Alighieri with the office in Berlin, Germany. This interview gave us the opportunity to gain more knowledge about the cultural relations between Germany and Italy, as well as the association’s work to promote Italian culture in Berlin. Mister Luigi Mercuri shared with us his vision about cultural diplomacy. Società Dante Alighieri was founded in 1889 by a group of intellectuals guided by Giosuè Carducci. The aim of this cultural association is to, "protect and spread the Italian language and culture throughout the world, reviving the spiritual ties of compatriots abroad with the mother country and nurturing among foreigners love and the cult of the Italian civilization" – Società Dante Alighieri. The interview started with a brief introduction about Mr. Mercuri’s work in the association of the Dante Alighieri. The interview covered questions about his personal career, the diplomatic and cultural relations between Italy and Germany before finally discussing cultural diplomacy and how culture can be a tool in resolving conflict. 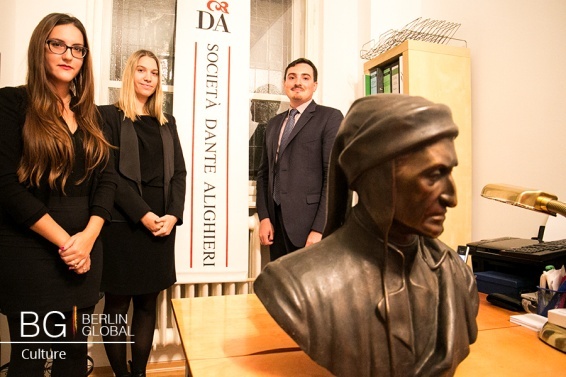 Could you tell us the reason why the Società Dante Alighieri was founded and the scope and aim of your work here in Berlin? Thank you for having me here. It’s a pleasure. I’m glad that the Dante is considered part of the ecosystem of cultural diplomacy, which is a choice that I highly appreciate because we truly do that, not on a political level but on a social and cultural level: diplomacy that reaches the ordinary people. Talking about the Dante, it was born in the wake of Risorgimento: the time when Italy was creating its own national identity. The Dante is directly linked to the idea of spreading the Italian culture within Italy and outside Italy. This was a tumultuous time, as Italy was unifying. And through unification, a group of high-level, high-ranking poets and writers with a political background decided to found the Dante. I would also briefly say that the year it was founded, in 1889, was a particular year because Italy still had regions that were reoccupied from Austria and still had some that were not yet under Italy’s domain. The role of promoting culture through language was a strategic one. The Dante Alighieri is of course called Dante because of Dante Alighieri, the “sommo poeta” as we say in Italy. He is the major individual who promoted the Italian language at the beginning, and almost created it. The Italian language is in part cultural and artificial, and the Divine Comedy that he wrote is the base and the foundation of our culture and language. What do you find most challenging and stimulating about your work? The Dante Alighieri is a society which is spread through the world in 60 offices, with our headquarters in Rome. Since 1948, the foreign chapters are technically independent. We are obliged, of course, to follow guidelines and trends that are suggested by the headquarters. The most challenging element is to find a balance between local independence and adapting to a common standard that should be protected. Could you tell us something about the formative offer of your association? The Dante Alighieri in Berlin offers a wide range of courses: Italian courses mainly, but also excursions. For example, we have excursions to the Berliner museums and we go for instance in search of Italian famous artists and identify them within the collections that are available in Berlin. We also offer different kinds of activities for children. We think we have a role of social glue here in Germany. There are many children of mixed heritage, or children who are born here of Italian heritage that would like to keep a connection with their own culture, their traditions and their language of course. The list is very long, but I would definitely say that the Dante Alighieri here covers every aspect of the social life of an individual in terms of the utilization of the language in Berlin. Your association also organizes events: could you tell us something about your next upcoming event? The next event is actually this Friday, on 28th October. It’s called ‘Opera & Spritz’, and it will take place inside the beautiful library in our headquarters in Berlin. It is an event dedicated to classical opera and Italian food. It is a combination of Aria, sung by young opera artists and singers in this beautiful new gothic library, and at the end we will offer different kinds of Italian food and spritz. What is also important is the topic. The group of artists is called Puccini’s Toaster. It is a young, independent ensemble of singers that has chosen a light motif for this evening: ‘brief encounters’. The word brief has a double meaning because in German, it means ‘letter’, and it is taking place in a library. First of all, you are all invited to participate. You will see how nice it is with your hands and eyes. What was the process? I have a different background originally: I come from the internationalization and business-consulting world. I work at the Dante as a free individual without compensation, for the appreciation of the Italian language and culture, as all as the other members do. We are a non-profit society. I used to work at the Italian Embassy trade agency, so I was already promoting Italy on the business side in the technology sector. Through friends I heard about the Dante Alighieri and participated in the events, and the President and Vice-President met me regularly at the events until they needed a third support inside the decision-making body and that is how I entered. My goal was to bring an entrepreneurial element to the Dante to bring it back to its glory times. How important do you think the role of Società Dante Alighieri is? I think it’s crucial. This doesn’t apply only to us as Dante Alighieri, promoting Italian language and culture, it applies for any association that has as a goal the promotion of culture in a non-conflictual way. The work that high diplomacy does: state meetings, global summits, regulation of trade agreements and immigration agreements are all crucial, but true integration and tolerance can only happen at the base level; at grass-roots level. I think institutions like this one are the fundamental key to enable acceptance and tolerance. The Italian community in Germany used to be a group of migration origins, and they integrated themselves very well also thanks to organizations like this one. What do you think your association’s most important achievement is? The most important achievement of this association, in my opinion, is the endurance. We were here before the war and after the war. It was re-founded in 1956, we had our 60th anniversary this year and we managed to go across time with the support of individuals who were simply helping for the purpose of the culture with no personal interest. We also survived through difficult diplomatic times, like the Cold War here in Berlin. I think endurance, perseverance and enabling tolerance and acceptance. Since we are in the Berlin office of the Società Dante, how do you think the relations between Germany and Italy have changed over the years, and how is the Società Dante promoting culture in this sense? Very good question. I think the relations between Italy and Germany are phenomenal, both on a cultural and on a political and business side. Germany is Italy’s first import and export partner. This means there is a vast amount of companies that work together to produce products and services. 30% of most Mercedes cars have Italian components, for instance. At the same time, there is a cultural understanding. Many funding pillars of the German literary culture were born in Italy. From Goethe to Schiller, Italy was the example; the base to start and bring back classicism. German neoclassicism was born out of Italy and out of the Renaissance, which is crucial in any kind of university studies in Germany, the classical culture. Plus, the migration: the Italians in Germany are the second largest community. The interaction through tourism: the Germans in Italy are the largest community of tourists. So I think they are the two countries which are the most integrated in Europe, and I have the feeling sometimes that the press does not acknowledge it enough. Given that we are dealing with culture, I would like to ask you what is cultural diplomacy according to you and how can we use cultural diplomacy between Italy and Germany to strengthen their relations? To me, cultural diplomacy is the ability to enable a bridge between cultures. A bridge between cultures can be constructed in various ways, in various materials, in various environments, but the purpose is similar. It is to bring civil societies together, and by bringing them together make them know each other and find out they are not very different in the end, and actually appreciate the differences even more, because that’s a peculiarity. Since we understand that cultural diplomacy might be a tool for conflict resolution and to promote multiculturalism, I would like to ask you if you can give an example of a particular time where you were involved in an interesting and successful cultural dialogue? Absolutely. Our cultural dialogue, I think, starts from the bottom and goes to the top. As I said before, from courses for children who learn Italian here on weekends or on other occasions, to university professors coming here and exchanging their opinions. For example, there was recently a presentation about Goethe and Dante, about how they have been misused in the past for national purposes, so I think that rather than give you a simple example, I give you a trend. The prism of the Dante reflects the lights of tolerance in different ages, in different special societies. And that is what we do. That is very interesting because tolerance is very important in the globalized world we live in, so I would like to ask you what do you think the role of cultural diplomacy is in the world we are living in right now? I think it is more and more crucial. I believe that globalization, social media, the internet and travelling are enabling a mass of informal cultural diplomacy that we cannot even quantify yet and we do not see the results directly. But the world is going towards, in a way, a path of informal cultural diplomacy which is available to anyone and, at the same time, people are scared of it. So I believe globalization is full of tools of cultural diplomacy that go beyond activities such as the Dante’s, but organized cultural diplomacy is still needed because it is the only way to give structure to a process. Given your personal career, what advice would you give to young people that want to pursue a career in the cultural field? Well, not coming from a mainly cultural background, I would say that my perception on things is a bit different. In Italy, recently, policy-makers have been talking a lot about promoting more and putting more value on the fantastic cultural resources that we are lucky to have, and I think that is very important. So the entrepreneurial aspect of culture is key to maintenance and promotion. Many operators that work in the field of cultural associations and institutions often lack know-how in this aspect, and the integration between cultural know-how and entrepreneurial know-how I think is the best match. Thank you very much. To conclude this interview, is there anything you would like to add? Yes. I would like to add that we just have concluded the Italian language week, which was last week, and it is fantastic to see how Italian language is re-emerging, even though there are no apparent geopolitical reasons to learn Italian. We have not had a fantastic colonial history. Yes, we spread out to the world, mainly through integrated Italians that also speak the local language, so what I would really like to say, also to the viewers, is that if you choose to learn Italian it is only for the love of culture. There is no hidden interest, there is no secondary objective, and that is what makes it so nice at the Dante. People who come here truly come for the passion of culture. At the end of the Interview, Mr. Mercuri was glad to thank the ICD team for the opportunity to share his views on Italian heritage and cultural diplomacy. It was a great opportunity for both sides to share knowledge on Italian culture under different aspects. After all, as Mr. Mercuri said, “if you choose to learn Italian it is only for the love of culture”. For more information about the Dante Alighieri Berlin, visit their website at www.danteberlin.com or their Facebook page at www.facebook.com/dantealighieri.berlino/?fref=ts.